By September 2018, the first steps in the Oysterville Church restoration project had been completed. The walkway had been replaced, the porch repaired, the cedar shingle roof had been replaced and the picket fences and exterior of the church had been painted. 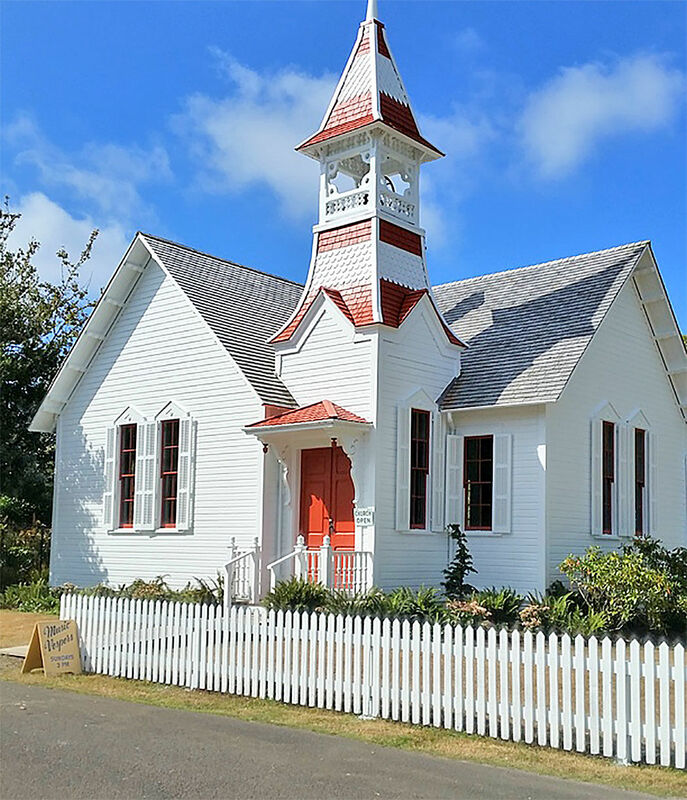 The fresh wall and ceiling papers, the polished pews and wainscotting, and the restored windows give the interior of the Oysterville Church renewed life, yet keep the historic quality of the 1892 structure. The history of the Oysterville Church restoration can be seen through the window looking east from the Sunday School room toward Territory Road. Through the top panes, the view is wavy, like the old panes, themselves. The bottom left pane is less wavy, perhaps replaced in a former restoration, and the bottom right pane is quite clear, probably one of the two replacements needed during the project just completed. Close-up views of the wall and ceiling papers show the characteristic Victorian attention to detail. OYSTERVILLE — The extensive two-year renovation of the Historic Oysterville Church is complete. From a new roof and fresh exterior paint to rebuilt windows and reproduction heritage wallpaper, the iconic structure sometimes called “The Pearl” of the village, is all aglow. “And just in time to celebrate the 165th anniversary of the town’s founding,” said David Williams, president of the Oysterville Restoration Foundation (ORF). It was Williams’ great-grandfather Robert Hamilton Espy with his friend Isaac Alonzo Clark who paddled ashore near present-day Division Street on April 12, 1854. Clark soon platted the town, said to have been named “Oysterville” by Elvira Stevens, an early hotel owner in the village. It wasn’t until 1892 that Espy donated the property and financed the building of the Baptist (now ecumenical) Church. This time around, ORF trustees Paul Staub and Martie Kilmer played lead roles in researching materials and methods, and in hiring appropriate contractors. Staub took charge of the windows and exterior work. Kilmer researched heritage wall and ceiling papers and oversaw the clean-up of pews and wainscotting, both of which are original to the church. Work began in June 2017 with removal of the old and installation of new cedar roof shingles by Solum Company of Astoria. The $18,500 cost was covered by the Kinsman Foundation ($15,000), individual donors from Oysterville ($3,200) and the ORF General Fund. In April 2018, the old cedar walkway into the church was replaced, along with the porch floor and parts of the porch railing. Baker and Son Construction of Long Beach did the work at a cost of $2,600, paid for by the ORF General Fund. Last August wood gutters were installed on the west side of the building and downspouts were replaced by Dry Coast Gutters of Ocean Park. The $450 cost was covered by the ORF General Fund. In September the church exterior and the surrounding picket fence were prepped and painted by All About Painting of Seaview for $7,850, funded by the ORF General Fund. Baker and Son were back in March to repair the porch roof and exterior siding for $1,000. At the same time, a number of the wood-frame windows — badly deteriorated over the years — were removed. Those that required rebuilding were taken to Wooddale Windows of Portland where deteriorated wood parts were replaced and the intricate workmanship of the original craftsmen was carefully replicated at a cost of $8,400, funded by the ORF General Fund, after which Baker reinstalled them. “Bottom line: ORF needs to replenish its general fund,” Paul Staub said. Once the exterior work was completed and it was determined that any previous leaks had been corrected by the new roof and flashing, Kilmer began researching appropriate wallpapers. She started by asking old-time residents of Oysterville what they remembered of earlier papers and put out an all-call for photographs. The papers finally chosen were from Morris & Company’s heritage collection. After much consultation with Oysterville residents, Kilmer chose the “Willow” pattern, which was designed and first produced in 1887, just five years before the church was constructed. The ceiling paper also was first produced in the 1880s. Called “Anaglypta,” it is an embossed paper, reminiscent of the old tin ceilings, which were finished by pressing designs into them. They were very popular in Victorian buildings in the late 19th and early 20th century. “We chose it because it’s a paintable paper and can easily be repainted for the next renovation,” Kilmer explained. The wallpaper installation was done by Jeffrey Tritt and Associates of Seattle with help from his son, Sam. The scaffolding needed for the ceiling paper was loaned and set up by Mack brothers Hannes and Alex. The two men also disassembled the pews and reassembled them when the papering project was complete. 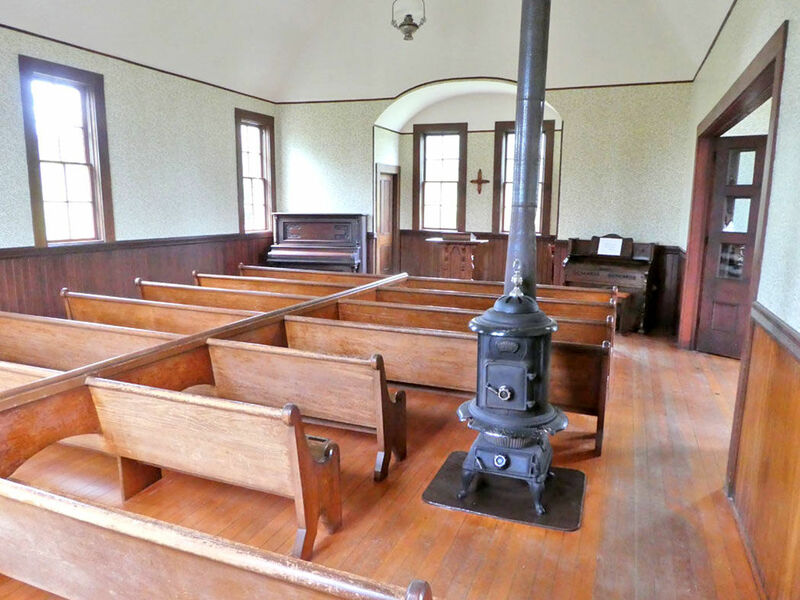 “They also did a fine job of cleaning the pews and wainscotting with Murphy’s Oil Soap,” Kilmer said. “A great finishing touch!” The wallpaper project was paid for by a $25,000 grant from the Kinsman Foundation. Pleased to read that the renovation work has been completed at the Oysterville Church an opened for public to pray and worship. Thanks for sharing updates.